An end-to-end solution for managing on-campus hiring. Universities are a prime destination to hire great new talent, and this app helps you do it more efficiently. Have all the details you need at your fingertips, and circumvent confusion during hectic job fairs. Engage your potential employees and keep them informed throughout the hiring process. 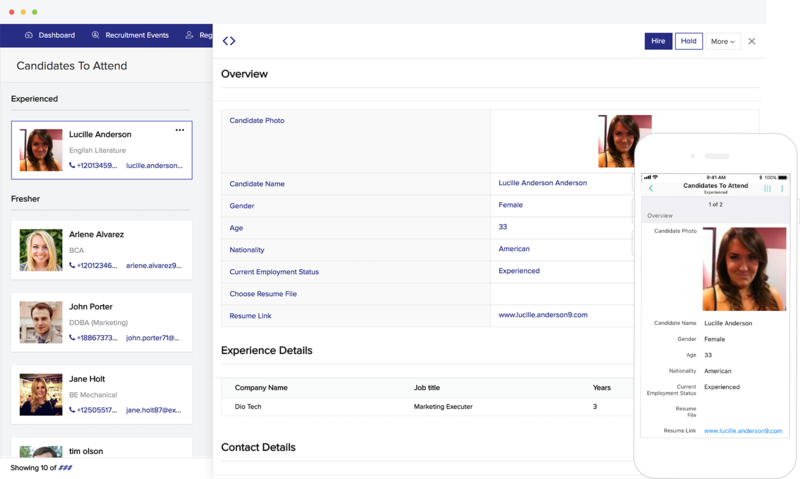 With this app, you'll be able to wrap up entire recruitment drives with no hassle at all. The only tool hiring managers will need to accelerate recruitment processes. Use color-coded, calendar-style reports to plan recruitment drives that stretch across several days. This feature will ensure that you efficiently allocate staff to each event based on its duration. Put customized registration forms on your website to allow interested candidates to register for the drive online. 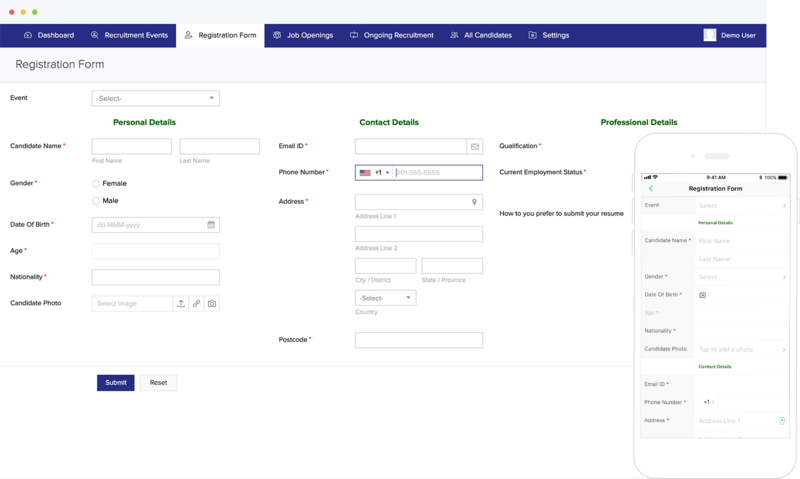 Web forms can be configured to validate candidate information and will automatically be added to the app once it is submitted. Keep candidates and potential employees informed about their hiring status by setting up automated mailers. These will send emails to people if and when they are selected, rejected, or put on hold. 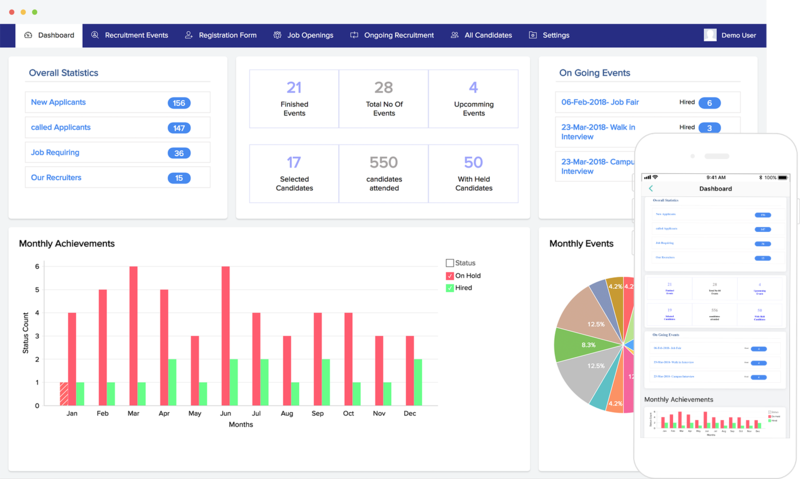 Keep tabs on resources allocated to each drive, organizations involved, universities visited, and candidates in the hiring pipeline with a compact, unified database. Set up reminders and alerts. Organizing and attending a host of recruitment drives can get confusing. Ensure that you never miss an appointment by setting up automatic reminders that can reach you and your colleagues by email or SMS. Group students being hired by university, role, or location in each drive. Easily keep in touch with them by configuring personalized emails to send to respective groups whenever you need to relay essential information. All our apps are fully customizable, right out of the box. Our drag-and-drop form builder coupled with the guided scripting feature will enable you to add limitless functionality to your app in minutes. For instance, you can configure reminder emails to be sent to registered candidates before interviews to maximize turnout. For every app you access on your computer, there's a fully optimized native one waiting for you on your smartphone. Enjoy all the features of your app wherever you go, and on any device. 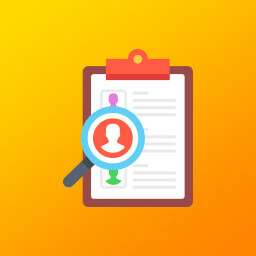 You could take notes in real-time on your phone during interviews, and have them instantly synced to an interviewee's database entry on your computer. We're flexible. Zoho Creator features integrations with a host of major software solutions like Quickbooks, Zapier, and Salesforce to ensure seamless connectivity between your various productivity applications. You can also embed registration forms on social media platforms, ensuring that more people are made aware of recruitment drives.